Power through your swim, bike, and run in comfort. Make your next triathlon that much easier with the Louis Garneau Men's Tri Power Lazer Short, providing lightweight and breathable support for your body. These moisture-wicking shorts feature a compressive fit and a heat-reducing treatment ensuring that even as things get more intense, you'll stay cool, calm, and collected. These tri-specific shorts are constructed from Lycra Power fabric, featuring a complex knit that has more lycra-per-square-inch than the competition. This additional stretch translates to more support, helping to reduce the effects of micro-oscillations and road noise on your muscles. Furthering this support, the Lycra Power fabric provides a compressive fit, improving circulation and preventing lactic acid from building up in your overworked muscles, effectively reducing fatigue by 10 to 20% over a long duration. Constructed with an 8-panel design and incorporating their Crotch Flex panel, these shorts are joined with flatlock seams to reduce chafing and increase muscle support while preventing the shorts from bunching while in the saddle. The Tri Air chamois differs from road-specific seat inserts by conforming to the body through a wide range of motions, being there when you need it and virtually disappearing when you don't. 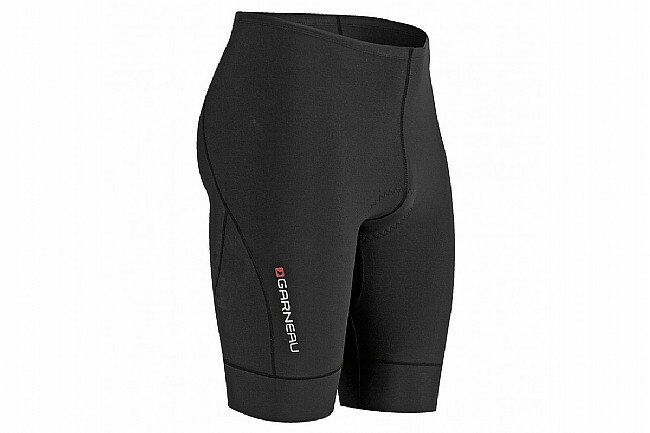 The Louis Garneau Men's Tri Power Lazer short features an elastic waistband and wide, laser-cut leg openings to provide a secure fit that doesn't cut off circulation, and an adjustable elasticized drawstring in the waistband allows for a customizable fit.